Gladys Elizabeth Tull (July 5, 1905-September 25, 1970), the daughter of Jesse & Alice (Rowlison) Tull, was born in Lodi, CA but raised in Kirksville, MO from early childhood. She graduated from Kirksville High School in 1924 then attended Northeast Missouri State Teachers College (now Truman State University) where she received a Bachelor of Science in Education in 1929. Miss Tull was employed as a secretary and worked for several firms in the city and for her home church, First Presbyterian, Kirksville. 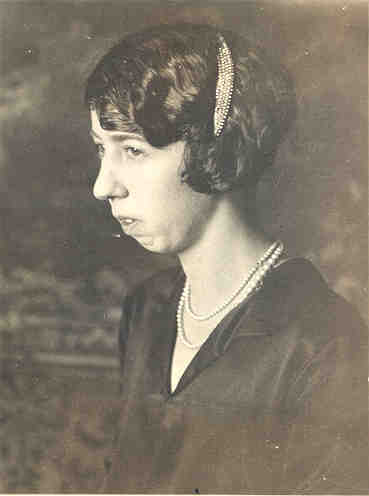 She was active member of the Kirksville Business and Professional Club and of the women’s organizations of her church. Miss Tull's scrapbook contains programs, photos and other memorabilia she kept during her high school and college years, along with a few childhood photos. It is in My Girlhood Memories, a volume published for that purpose by The Reilly & Lee Co of Chicago, 1920. Most photos are labeled, some are not; occasionally handwritten narrative “histories” explain a photo or document. Her photo album consists of 100 pages of photographs, most of which seem to be of her extended family. Only the first 15 pages have captions of any kind and they are written in pencil on black album paper so are difficult, sometimes impossible, to read. The album pages are in extremely poor condition and break at the touch; they were no longer attached to the cover so have been removed and placed in protective plastic sleeves in a 3-ring binder. Miss Tull gave these books to the College library before her death.